Williamsburg, KY – Bear Archery recently confirmed their long-standing support of youth archery by naming the Scholastic 3-D Archery Association as the recipient of a 2019 sponsorship. Bear Archery is one of America’s oldest archery manufacturers having been founded by none other than the famed Fred Bear himself. Archery was a life-long passion of Fred Bear. He was an expert marksman, an avid outdoorsman and an inspiration for many archers with his natural shooting ability. S3DA, in conjunction with Bear Archery, certainly wishes to continue providing a well-rounded program that Fred Bear would be proud of. Scholastic 3-D Archery (S3DA) is a youth archery organization that seeks to foster, educate, and guide youth in the areas of 3-D, indoor target, and outdoor target archery as well as safe, ethical bowhunting practices. 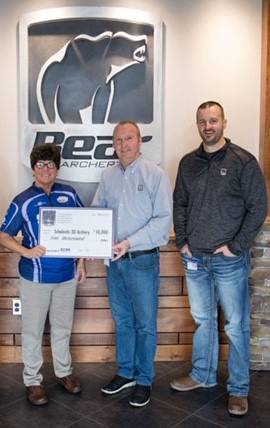 Bear Archery’s sponsorship of S3DA not only allows the promotion of fair-chase and ethical hunting but also continues to build on the foundation of partners and sponsors whose goal is to push conservation efforts as well as promote bowhunting.